It is COLD and windy here in the Shenandoah. But at least it is not snowing! I hope that everyone is nice and warm and happily stitching away while watching the Olympics! I have a been busy substituting and trying to keep up with my assignments so I must admit that I have not watched many of the events. But when I do get a few minutes, I like to switch them on and root for the ol' USA! I thought that I would post a progress pic of Bea. She is coming along slowly but surely. After that nasty frogging incident I wanted to put her down for awhile but eventually we made up and I finished the motif that I was working on. However, I have not been able to spend a lot of time with her the past few days but I think she understands. Sorry if the pic is kinda dark. I hope to get a better one when the sun is out! Tonight I am starting to pack for my trip to Williamsburg and The Gathering of Embroiderers. I am so excited and I truly appreciate everyone's enthusiasm for me! I promise to take pics of all the pretties and post them for all to see. Hubby is coming with me and I think he is looking forward to it too. Besides, he can shop for my birthday which is coming up....eventually....in July! For those of you who have not seen a picture of the Richmond Sampler that I will be stitching, here it is. It commemorates the visit of Count Lafayette (Marquis de Lafayette of American Revolutionary fame) to Richmond, Virginia in 1824. Lafayette stayed with the Randolph family while he visited Richmond. For those of you who are not familiar with Virginia history, the Randolphs were one of the richest most powerful families in Colonial Virginia and even after Virginia became a state. They are still a prominent family...true bluebloods! 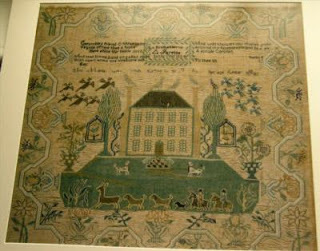 I am not sure who stitched the sampler but I hope to find out. Before I go, I want to thank everyone who has been stopping by and visiting my blog. Your comments light up my day. Really, it means so much to have fellow stitchers take an interest in what I do. I have learned so much through this blogging community! What a treat to have others share my passion. Again, thank you and Happy Stitching! Valerie, you Bea is Bea-utiful!!! Love the color. I love the Richmond sampler - looks like a TON of stitching. I love Richmond, I love Williamsburg and I can't wait to hear all about your trip. have fun!!!! I have a lot of LoVe for all you have going on, don't I? Bea looks fantastic! I love that color! And that sampler is gorgeous! I can't wait to see your start. Have a great time! What a beauty Bea is! I love her in Brethren Blue! That Richmond Sampler is stunning and can't wait to hear your thoughts on the silks! Have fun in Williamsburg! Your progress on Bea is wonderful. And how envious I am that you get to stitch that Richmond Sampler. What a beautiful piece. I'll look so forward to seeing your stitching as you go along!! Valerie, I am pea green with envy that you get to stitch that sampler. I love repros, and having a story behind the repro is even better. Add history in, and I'm a goner. I'm sooo going to enjoy you working on it! I hope you have a fantastic weekend. Love the Quaker, too!